Lee, from Ontario Canada writes. Teddy is now on NUTRO Natural Choice Puppy, Small Breed, Chicken, Whole Brown Rice and Oatmeal but I was considering another brand and want to find out which one is best. Teddy is a Bichon Frisé Puppy. 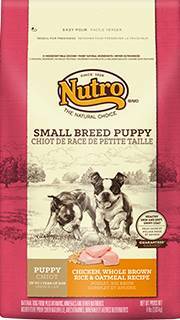 Nutro Natural Choice Puppy Food is made by the Nutro Company, headquartered in Tennessee, just outside of Nashville and has been in business since 1926. All food is made in facilities located in the U.S.A. The company also makes the popular dental chew, GREENIES® DOG TREATS. Does your small breed puppy or adult have a food that you would like us to review? Please use the form at the bottom of this page to make your request. If you have not done so already, check our Best Dog Food Page to see if your dog's food is already listed. If not, we'd love to review it for you. This food comes packaged in two sizes: 4 lbs., 8 lbs. 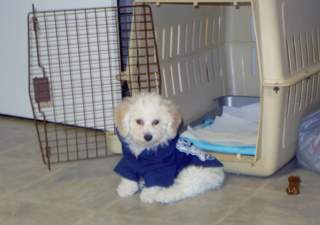 It is indicated for small breed dogs up to 1 year of age and 25 pounds at maturity. Its unique kibble shape is designed to reduce tartar and plaque buildup. For a small dog, this is important. The kibble is about the size of a pencil eraser making it easy to eat even for the smallest of small breed puppies. The following information was taken directly from the Nutro Company Website. Chicken, Chicken Meal, Whole Brown Rice, Brewers Rice, Pea Protein, Chicken Fat (preserved with mixed Tocopherols), Whole Grain Oatmeal, Dried Plain Beet Pulp, Rice Bran, Natural Flavor, Fish Oil (preserved with mixed Tocopherols), Sunflower Oil (preserved with mixed Tocopherols), Soybean Oil (preserved with mixed Tocopherols), Potassium Chloride, Salt, Choline Chloride, Zinc Sulfate, Niacin Supplement, Vitamin E Supplement, Calcium Pantothenate, Riboflavin Supplement (Vitamin B2), Pyridoxine Hydrochloride (Vitamin B6), Vitamin B12 Supplement, Iron Amino Acid Chelate, Copper Amino Acid Chelate, Selenium Yeast, Biotin, Manganese Amino Acid Chelate, Vitamin A Supplement, Thiamine Mononitrate (Vitamin B1), Vitamin D3 Supplement, Potassium Iodide, Folic Acid, Rosemary Extract, Decaffeinated Green Tea Extract, Spearmint Extract. NUTRO® Small Breed Puppy Chicken, Whole Brown Rice & Oatmeal Recipe Dog Food is formulated to meet the nutritional levels established by the AAFCO Dog Food Nutrient Profiles for growth, gestation and lactation. This is a high quality dog food that uses chicken as its primary meat source with added plant based protein sources (pea protein) to increase the overall protein content. According to most reviews on a variety of websites, the food is tasty according to their dogs and recommended by their owners. Most dog owners report that their dogs eat the food willingly, even picky eaters and have no adverse gastrointestinal upsets. Many puppy owners report that they continue to use Nutro products well into their dog’s adult years. The numbers do not always tell the whole story about a dog food. Nutro Natural Choice Puppy food has much going for it in terms of quality. The food contains no corn or wheat which is the source of some allergies in dogs. The food does not contain any artificial colors, preservatives or flavors. Guarantee on the bag states “The only brand guaranteed to improve skin and coat.” This is a plus for dogs that have allergies or skin problems. DHA is a natural omega-3 fatty acid essential in neurological development of the brain and nervous system and vision in young mammals. It is being used in human infant food and is now being promoted to improve brain development and assist with vision in young puppies. This company received some negative reviews posted on sites such as Consumer Affairs during the massive pet food recalls of the 2007-2008. Not only did this company fall victim, but many others did as well. No one food is perfect for every pet. Each puppy has its own constitution and it is the responsibility of the pet’s owner to make the final decision about an appropriate food. NUTRO Natural Choice Puppy, Small Breed Chicken, Whole Brown Rice and Oatmeal is an excellent choice as a premium brand of puppy food. Purchase Nutro Puppy Foods Directly from this page. Have a Dog or Puppy Food You Would Like us To Review? Provide as much information as possible including the full name of the food, your dog's name and breed and an approximate age of your dog. We love photos and may request that you submit a photo of your dog.